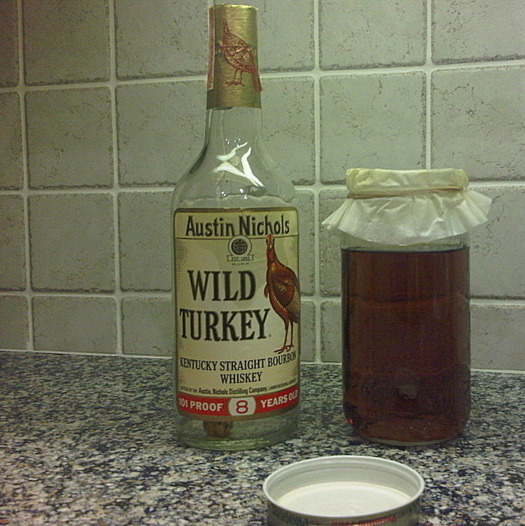 I found this bottle of Wild Turkey hidden in a cabinet beneath the bar at my parent’s house. I know it says “8 years old,” but, it turns out, it was purchased in 1983. Meaning it’s older than I am. Unfortunately, the cork had rotted to the point where it couldn’t be removed without it disintegrating into the bottle. Which is exactly what happened. Fortunately, Father had a plan: Coffee filter. So, we grabbed an old spaghetti sauce jar and filtered the Kentucky bourbon into it.